Slope is an important element of roof design. In snowy regions you often see steeply sloped roofs because steep roofs shed snow easily, but you will even see them in warm climates because some people think they look good apart from any functional advantages. Like anything, it can be overdone, and it comes with a price. A steep roof requires more area, so more tile, and more structure, adding to the overall cost. Some houses have a very shallow slope. Manufactured homes are usually like this. The roof design requires a shallow pitch so that the whole unit can be loaded onto a truck without exceeding the height limitations imposed on trailer load. I consider it one of the least desirable traits of your typical manufactured home. Manufactured homes have much to offer but this is a price you pay. There are some manufacturers that get around this, either by adding a roof on-site, or hinging the roof to one wall, and then jacking it up on-site. This is not strictly a characteristic of manufactured homes. In the South, especially, you find areas where shallow roof designs are common. Being a cost savings they are weighted towards the lower end of the housing market. My sister lived in Florida, and from my visits down there I would say that low roofs were dominant in her area. I favor a steeper sloped roof. There is something about the proportions that seems more natural to me. I would rather see one-and-a-half stories, with the second floor embedded in the roof, than see two stories and a shallow roof. With the latter I always feel like there is something missing. Perhaps this is an artifact of my upbringing. 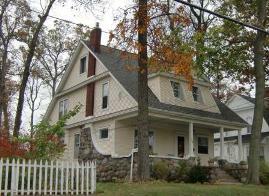 I was raised on the gabled end of such a one-and-a-half story house. The angled roof formed much of my ceiling. It made the room a little quirky. The rest of the world had to make due with boxy rooms, but I had something special. From the outside the roof of the house was dominant, but not overbearing. With a shallow roof we would have lived in a ranch house. With the larger roof it made it seem more like a cottage. What the difference is and where you draw the line I do not know, except to say that the latter I love. The overhang is another aspect of roof design with aesthetic and cost repercussions. Most houses will have an eave. The roof will overshadow the footprint of the house by inches or feet. Occasionally, especially with manufactured housing, the roof stops at the edge of the wall. Functionally and aesthetically this creates a few problems. An overhang will shade the window during the high summer sun, while still allowing winter’s light to shine through. This makes the house cooler in summer. An eave and the shadow it creates visually softens the intersection between the wall and the roof. A sharp joint between the two highlights the geometric nature of the house. Some designers of modern houses prefer this sharp angularity. I suggest that we don’t want to live in a box with a pyramid topping it. We want to live in a house. Overemphasizing the geometry tends to reduce its hominess. Perhaps this is one of the reasons why “modern” never became dominant. This overhang does come with a price. The overhang requires a larger roof, and thus incurs a larger cost. Certain styles of house are known for the depths of their eaves. 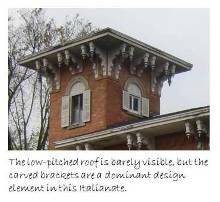 Italianate houses usually have a couple of feet of overhang, and have large, carved brackets supporting the overhang. Craftsman houses have a similar story but the brackets are usually simple triangles. Tidewater houses take it to the extreme, with the roof ends requiring their own support columns that also define the outer edge of a wraparound porch. Second Empire houses, with their mansard roofs, are another example of a dominating roof design. In this case the roof becomes the wall and there is usually little or no eave. I understand there is a story behind the Second Empire style. Zoning restrictions limited the height of walls, but did not count anything covered by a roof. The roof draping over the walls allowed a larger house to fit in the lot. Government policy inadvertently created this style. The final characteristic of roof design that I am going to consider is the covering. The choice of material affects the color and texture of the roof. Today there are many more choices than in the past. A few things have gone bye-bye. My asbestos shingles, for instance. Many more have come along to replace them. For example you can buy stone-coated steel shingles. Each material has its advantage, but from an aesthetic standpoint, between the various options you can create almost any look you want. All it takes is money. If you are in a house long enough you are likely to face the prospect of replacing your roof. Most people have composite asphalt shingles, and these will only last 20 to 30 years. In some cases local regulation may force you to replace it sooner. I once sold a 12-year old house, but was told that no bank would finance it unless I replaced the roof. It had to do with some weird insurance clause in the state laws. When you do replace your roof you aren’t likely to affect its shape, its slope or other structural aspects of its roof design, but you can change the texture and the color of your roof. You can have dramatic effect on your house, but you will have to live with it for the next few decades, unless you want to fork over tens of thousands of dollars a second time. This is one case where it is worth taking some advice from a professional, simply because of the costs and potential impact of your decision. As a personal preference I like the idea of roofing options that will last a long time. Generally the standard composite shingles will have the shortest life. Getting the more expensive ones will add to the expected life cycle. Next up will probably be your metal and plastic shingles and panels. For the metal the longevity will depend on the quality of the coating. At the very top you have your ceramic and cement tiles of various types and slate. My asbestos tiles may no longer be available, but they have lasted for 105 years and should last another 100. Ceramic tiles should have a similar story. The caveat with all of these permanent solutions is that they may not survive things like tree branches and earthquakes and the repairs can be very expensive. I recently was in Ireland, and I managed to see much of the southwest of that country. There were a few thatched roofs, a wonderful roof I would like to see more of, but otherwise the dominant material was slate, or its artificial equivalent. Some I know was slate, much, I suspect was man made, but aesthetically it made little difference. It was a slate look. It is a very solid roof. When you see a slate roof you respect it. Homely or beautiful you know it is solid. I will tell my own cautionary tale as I wrap up this article. My kitchen roof needs to be replaced. It is a standard, black asphalt shingle. It does not tie into the roof on the main part of the house as my house has two stories, but the kitchen addition only one. 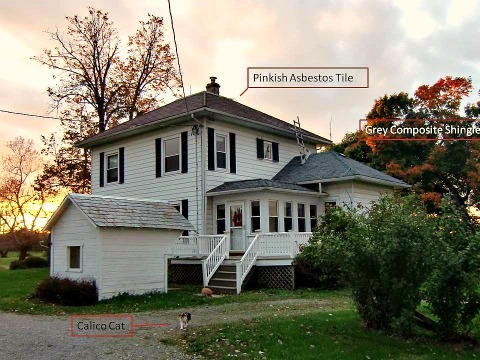 The roof on the main part of the house is a pinkish-red, flat, thin asbestos tile laid in a diamond pattern. The tile is a uniform color, but lichen growth and moss have mottled it. I would love to match this, but I cannot. 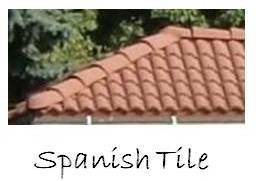 The closest I can come is a cement tile that matches the color, but is too heavy and too thick. The texture would not look alike and they weigh far more than what is on there. The metal tiles only have a limited selection of reds and they are all too dark. I have not found anything close in any kind of plastic tile. This leaves a composite shingle. Here I have a much wider selection of colors and manufacturers. These also tend to have a mottled coloration, so I can get a decent color match, but it will in no way match the pattern. I point this out not that I can’t handle the mismatch, but to illustrate that we can’t always get what we want, even with all the choices we have available. Editor's Note: I finally did replace that gray shingle. Learn all about that project here.